Happy Friday, friends! 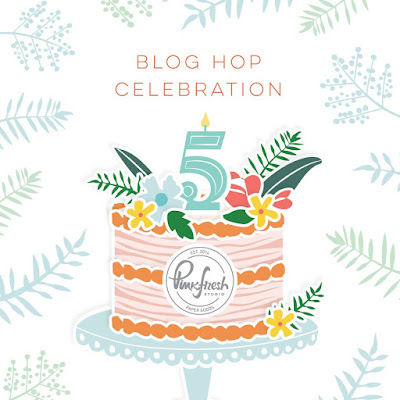 Welcome to the Pinkfresh Studio 5th Birthday Blog Hop! I'm so excited to be participating in this awesome milestone celebration of such a wonderful company. You should have arrived here from the Pinkfresh Studio Blog. Each designer is also giving away a $25 Gift Card...all you have to do is leave a comment on each blog to be entered to win one! Easy! The winners will be announced on Sunday, April 14th on the Giveaway Page. You must check this page to see if you're a winner, and you must claim your prize within two weeks. Here is a new layout I created using the new Out & About collection. It has really inspired me to scrap some of my travel photos. The colors are just so pretty, and I love all the different embellishments! I focused on the Tickets paper here, and I decided to cut a lot of them out and scatter them around my background. I used a few more patterned papers on top of some white cardstock and added lots of the Liquid Watercolors. These tickets reminded me of stamps. I used an edge distresser to tear up the edges a little to give them more texture and dimension. Some of them are raised up off the page with some adhesive foam. I also machine stitched through some of them with white and metallic gold thread. I love tearing paper...the edges just look so cool, I think! I love this rainbow striped paper. I used a torn strip of it down towards the bottom to pull in all the colors from the tickets. I went simple with my title here, and I mixed and matched some fonts. I used the blue script alphas from the Joyful Day collection and painted them gold. Isn't that little airplane puffy sticker so cute? Layering creates such awesome dimension...these tickets where perfect for that! Awww....look at my husband way over on the other aisle...haha. He wanted the end, I wanted a window seat and to sit by my sister, so that's how we wound up sitting...haha! As far as the background goes, I smudged a lot of white gesso down over the patterned paper. It turned out really bright, and I didn't want that to overpower all those colorful tickets. So I let it dry (almost) and then smudged more white gesso over it to soften it up. I like how you ca see it through all the tickets. I did add lots of colored thread to this page... my favorite! I wanted to bring in a pop of navy blue down here at the bottom, so I did that with some thread. 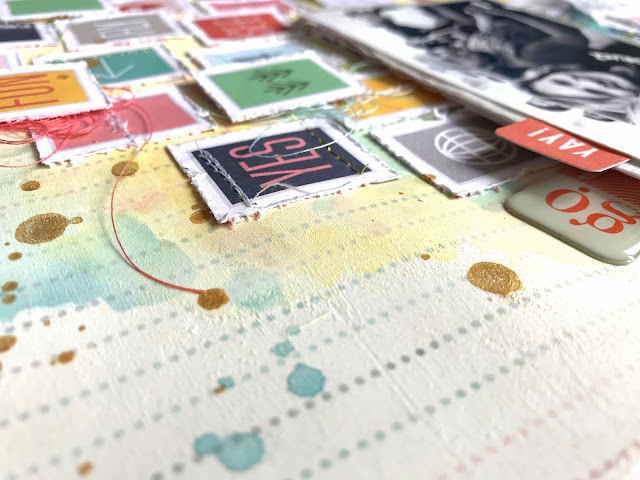 I also created a cluster of embellishments to the left of my journaling. Here's the cluster. I used Out & About Stickers, Die Cuts, Puffy Stickers...everything is so cute! And here are a few more close-ups to finish. I hope this inspires you in some way...I really love this collection and how it beautifully showcases any travel photos you may have. Be sure to check out my process video here for all the details! More news...if you do any shopping at Pinkfresh Studio, you automatically get this fun die included in your purchase for FREE! There will also be free/discounted shipping between April 5-7 on orders over $25. You must use the code FREESHIP5THBDAY. Shipping is FREE in the US and $5.50 for international orders. The next person on the list is Caly Person. Thanks so much for stopping by and hopping with us! Have a great weekend! Love that layout - so interesting! Love your layout! The watercolors and tickets are so pretty! What a fun layout! Nice to see that other people change their mind halfway through. Love this layout. So bright and fun! A beautiful layout...... fabulous color, texture and dimension!! Beautiful layout, love the papers. This layout is so fun & bright!! 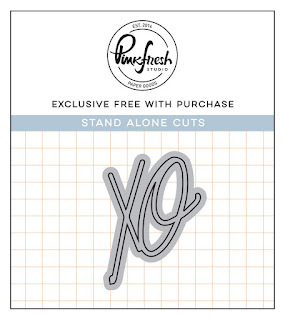 I can't wait to use the Out & About collection that I just ordered! Love the layers and colors of your page layout! And yes... the torn edges do look cool! This layout is just so fun! I love all the texture and dimension. ❤️❤️❤️this LO! Loved watching your process video too! You inspire me! Wow Missy such a beautiful layout and I love all the details. I could sit and study them forever. Beautiful job and I love the textures and embellishments you used! Missy....what a cute page! I really like the torn strip that goes across your page! It really sets off your page!!! Thank you for sharing! Love the flow, layers and colours. Awesome layout! :) Love how much detail you put into it. This beautiful layout looks like it was so much fun to make. love this layout, thinking about "scrap lifting" it for our summer trip. Such a fun layout! I really like it. Love the way you used the awesome Out and About! What a magnificent layout! 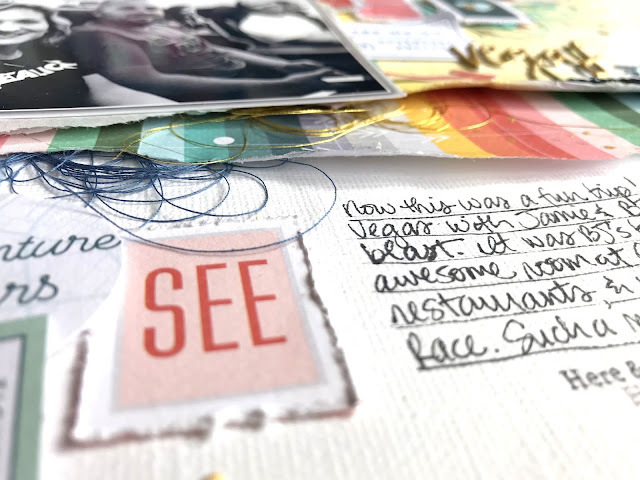 I especially love the torn paper and the strip of striped paper- striped paper was my favorite accent paper to use when I was a scrapbooker. Well, isn't that just lovely.......... I really aspire to be able to think in as many layers as you do. I totally get antsy with all of those layers, but I really want to be effortless with it...... one day. Thanks for sharing! What a fun layout! Love the layering of the tickets! Beautiful layout. So fun and cheerful. I love the colors and all those little tickets! Missy, I love all your layouts, gorgeous! Beautiful layout, I love the layers and the stitching! Love your layout. I found a pair of those decorative scissors in my cupboard recently that have a postage stamp edge so I'm excited to cut out those stamps too. Like the tickets on the layout. Thank you for sharing. Love your layout! I just returned from Vegas! This is so perfect!! I may be casing your creation. What a fun layout!! Adorable! Wow. I am sure a lot of time went into this. Thank you. How fun. I wish I were on my way to Vegas now. Fun layout! I love the torn edges! 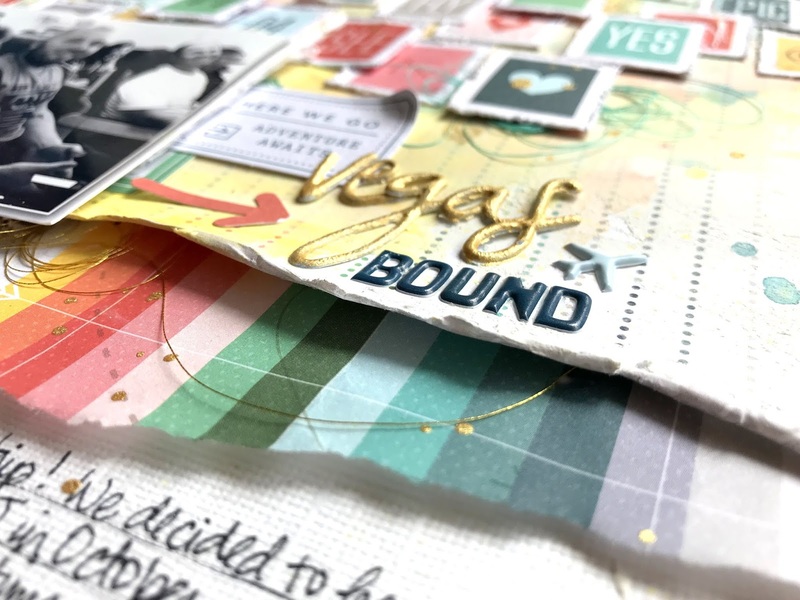 Love the colors, layers and texture on your layout. Super fun layout! You have certainly inspired me to add more dimension to my pages. So many layers, so much texture. Very nice layout! Amazing details, love how colorful it is...so sweet! This is just amazing! I love all of the details! i am not much of a scrapbooker but i recognize artistry when i see it!! thanks for sharing your process with us. Your layout is absolutely gorgeous!! I LOVE all of those fun bright colors, and I love the design and all the fun little details you've added! Really makes me wish I was good at scrapbooking :) TFS!! So sweet, so gorgeous and so cool. Love your layout! I really like all of the stiching. Love this layout! So interesting! Beautiful Layout! Love how you used the tickets to creates such awesome dimension. Thanks for the inspiration. I’ve always loved your style! It’s so much fun! Such a pretty layout! Love the layers and stitching! Love this layout, especially the strip of bright coloured stripes. Gorgeous!!! Such a fun layout, thanks for the great inspiration! Congratulations to Pinkfresh Studio celebrating their 5th Birthday with an awesome hop! Colorful,happy,sunny like Florida to me. I love it! Such a fun layout.Thanks for the great inspiration! 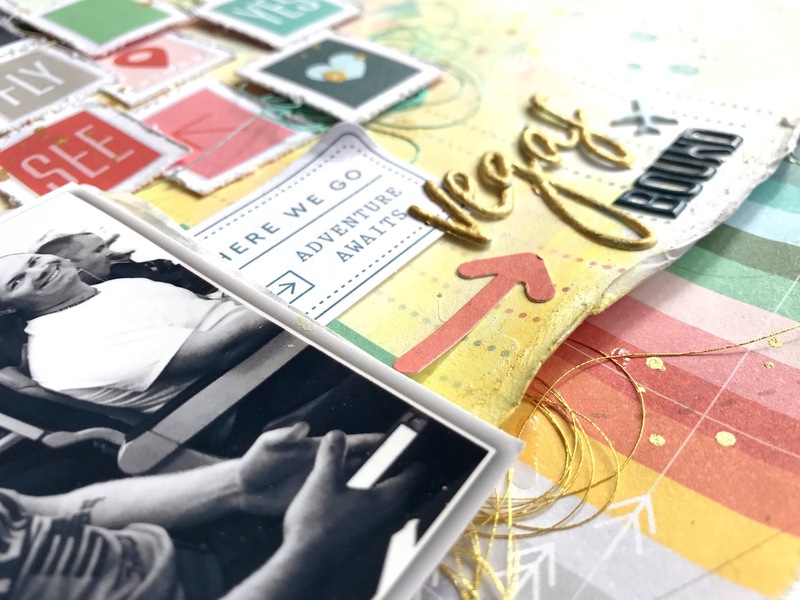 Lovely page to showcase your Vegas memories! 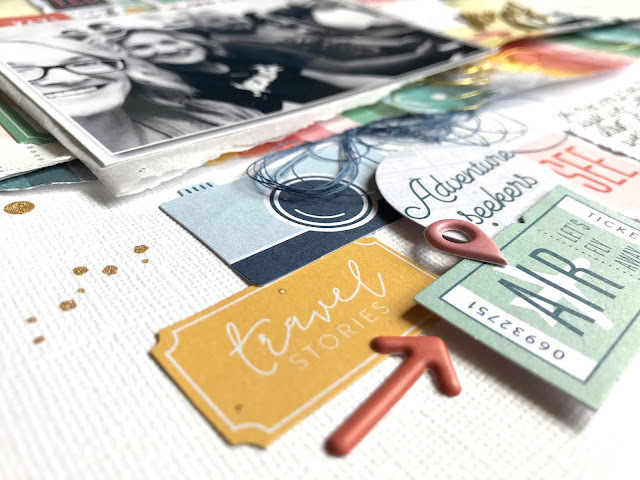 Very fun layout to document your travels. I like the distressing of the paper. Oh my...Love all those little details. Awesome work. What an awesome page! I love how there is so much texture from the stitching to the roughed up edges, and therised items. 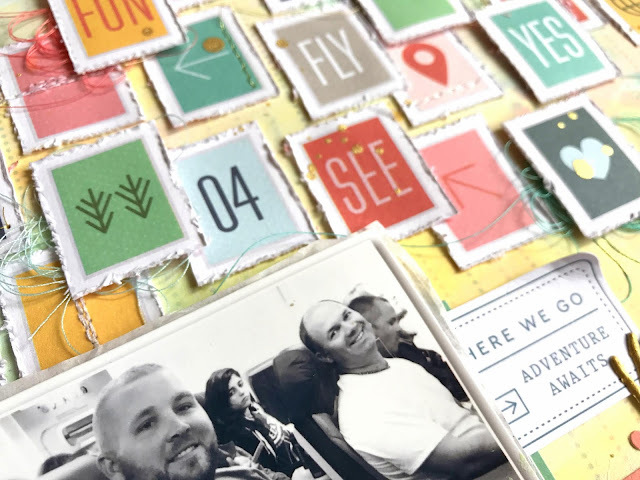 And you are right, this has some great items to use for travel pics. Love the way you used the tickets! Thank you! Such a fun, happy, colorful layout. I do not scrapbook but I am in awe of scrapbookers. Your page is so creative and eye catching. LOVE IT! just luv all of the layers! Such a cute, fun, colorful layout. Love it. Thanks for sharing. Such a great layout! I love PF's little puffy stickers - I always find something to use! What an amazing layout! Thanks for the inspiration! Terrific layering layout. Reminds me to make a few items extra for another project. Lovely cards! Love bright colors! I've never done scrapbooking, but the layout is fabulous! I recently bought this entire line of products, and now I know what I'm going to do first with it! This is amazing! Fun layout! Love the background and the ‘stamps’! Fabulous layout and great process video. Amazing how much the design changed when you just turned the background paper - love it! Fabulous layout, love the colours and all the dimension - you did a fantastic job! What a cool layout Missy! I love how you added all of the tickets, so creative! Lots of color and visual movement. I love it. I am in love with using threads as embellishments. You've done it well! A great layout, Missy! Love those colorful threads you used! I love all the texture on that layout. Its amazing! And the layers and colours really make it pop! I am going to CAS this design. Fabulous layout! Love all the layers, little tickets and fun colors. Wow! This is fabulous! Love all the little details which make the layout so much fun! Terrific layout. Thanks for sharing. 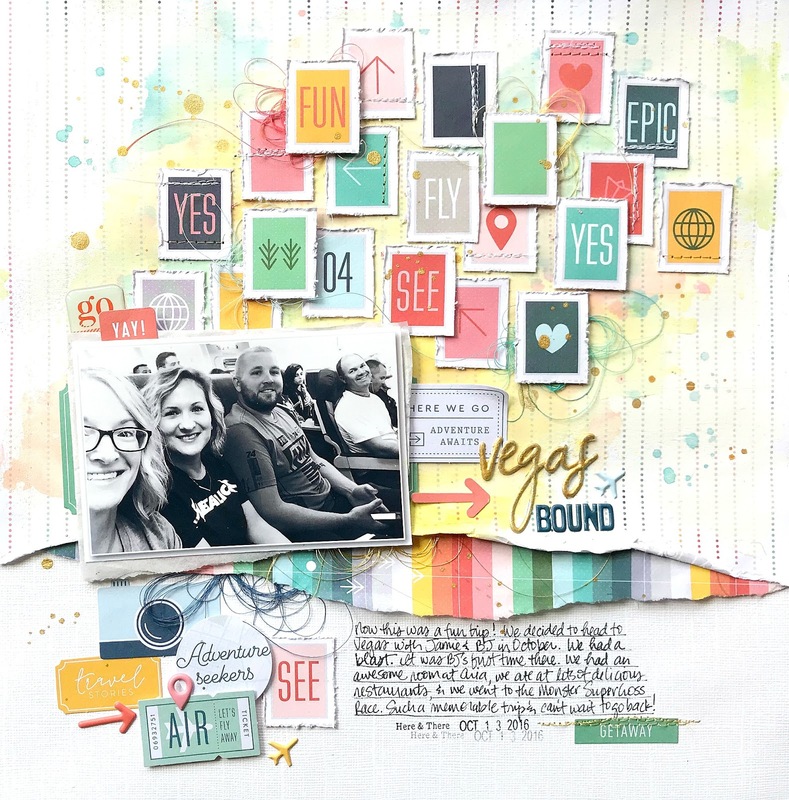 Cute page... lots of fun layers and textures! Vegas is where I was born.. so that caught my eye! Very nice! Very cool layout. I love the layers of colors. Very creative and unique layout. Very nice page! Lots of eye catching items. Great Job! Awesome job on your layouts! Such a fun looking layout!! I love the little details!! So cool! Nice project, Missy! And way cool to use gold to cover the letters - love that idea! You can tell you were using a lot of your favorite products and techniques; this project feels super happy. I'm going to have to try some of these, because I really enjoy this layout. Thanks for sharing and helping celebrate Pinkfresh's birthday! What a textured layout. So dynamic. Really great job. Thanks for sharing your creativity! Nice layout, Thanks for sharing. Such a unique layout and sounds like a fun trip! What a fun layout! I like all the layers of tickets and the texture from the distressed edges. Very creative page! I'm sure you had a lot of fun putting this together. I love it! Wow! What a masterpiece. This was made with love. Love how you sewed the edges, the colors and most of all the layout. Awesome. What a gorgeous project. Love all the details. 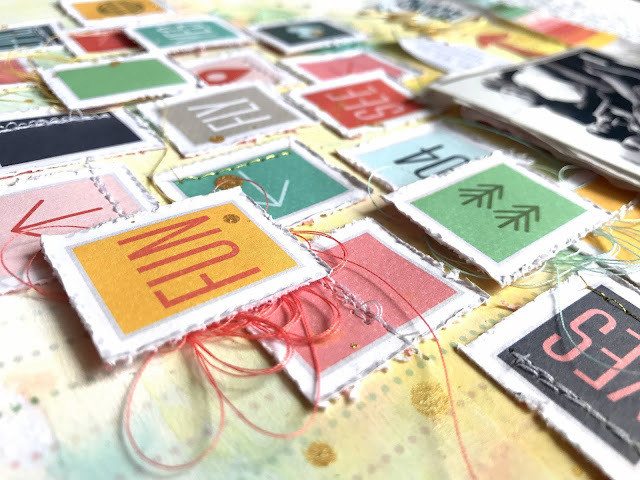 Fun way to use the stamps. Thanks for the ideas! Love the layout and the dimension. Such a cool layout. Love all the dimensions, the bits and pieces amazing!! Unique layout with lots of fun ideas. I love the stitching and all the different elements that make this so interesting to see! Your rainbow layout is so gorgeous and inspiring!!! We all love Pinkfresh and what a wonderful way to celebrate their birthday!! 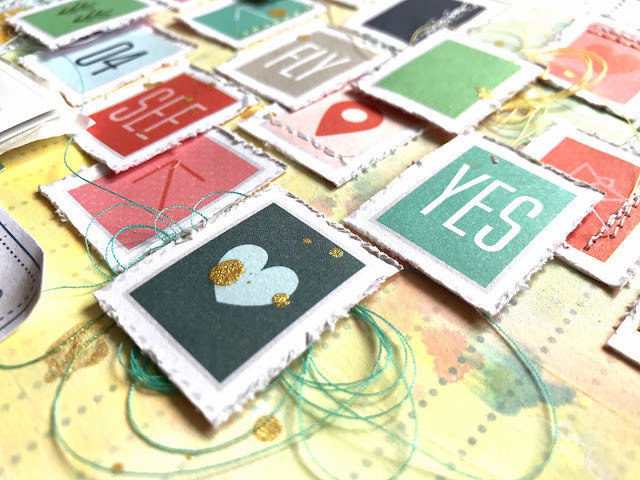 Such an interesting layout with all the little squares that remind me of stamps! Love the upbeat layout to match Vegas! Reminds me of the old travel trunks that used to have stickers all over them. Very creative layout. Totally awesome LO! I love the way you used all those stickers. Fabulous layering!! Fabulous layout! These tickets are awesome and I think the photo in black and white works perfectly with it! Wow that's a whole lot of fun going on! Fantastic layout! Fun, dynamic and lovely colors. Hey there! I'm Missy from sunny Florida USA, and I love all things scrapbook related. All the paper, the stickers, the paint...the more the better! I'm married to Marshall and we have two beautiful daughters, Reese & Paige. I also love teaching Les Mills fitness classes, cycling, reading and watching movies. I love documenting my life one photo at a time. Our Spring Sale has started!